Weather forecasters from the U.S. Air Force 45th Weather Squadron are predicting a 60 percent chance of favorable weather at the scheduled time for launch of SpaceX CRS-6. Liftoff of the Falcon 9 rocket and Dragon spacecraft is targeted for 4:33 p.m. on Monday, April 13, from Space Launch Complex 40 at Cape Canaveral Air Force Station. Launch coverage on NASA Television will begin at 3:30 p.m. If launch does not occur on Monday, the next launch opportunity would be at 4:10 p.m. on Tuesday, April 14. Click here<http://www.nasa.gov/centers/kennedy/home/index.html> for the latest information. Artist's impression of NASA's New Horizons spacecraft encountering Pluto and its largest moon, Charon, in July 2015. NASA Television will air media briefings at 1 p.m. EDT and 2:30 p.m. on Tuesday, April 14, to discuss plans and related upcoming activities about the agency's historic New Horizons spacecraft flyby of Pluto this summer. Briefers will describe the mission's goals, scientific objectives and encounter plans, including the types of images and other data that can be expected and when. 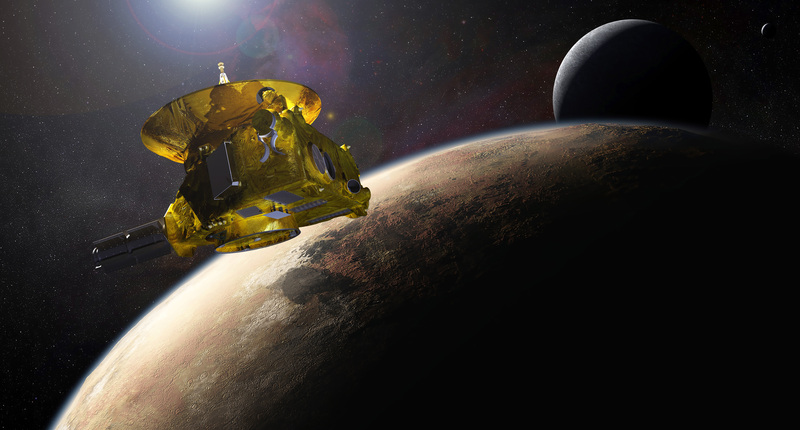 New Horizons will fly past Pluto on July 14. The spacecraft already has covered more than 3 billion miles since it launched on January 19, 2006. It will pass Pluto at a speed of 31,000 mph taking thousands of images and making a wide range of other science observations. Given the distance between Pluto and Earth, data from the spacecraft during the encounter will take approximately 4.5 hours to reach our planet. To participate by phone, reporters must contact Steve Cole at 202-358-0918 or stephen.e.cole at nasa.gov<mailto:stephen.e.cole at nasa.gov> and provide their media affiliation no later than noon Tuesday.. Media and the public also may ask questions during the event via Twitter using the hashtag #askNASA.